Photo taken with my iPhone...and it couldn't capture the red of the hat properly! I've realized that I'm still a bit behind on sharing the knits that I've finished these past few months. I'm guessing the main reason for this has to do with effort. Or lack thereof. Either it's avoiding the finishing process: having to weave in ends, finding suitable buttons, sewing on the suitable buttons, and clearing up enough space somewhere in the house to properly block anything. Not that the space would matter. It's been incredibly cold in my house this winter and living so close to the water means my place is horribly humid all.the.time. It's actually kind of gross. Imagine taking a shower and then grabbing your towel to dry off only to discover that it's still wet from the shower before. Ugh. Yuck! Rubbing yourself down with a cold and still damp towel is not how I want to wake up or to feel first thing in the morning. Then there's the photography. The timing is never perfect in which I can have both the Mister and the right natural lighting to take pictures. Although lately I'm starting to suspect that the Mister is purposely taking crappy photos in hopes that I'll never ask for his help again. For instance take the photos in this post (which were all taken with my iPhone...I'm SO sorry!! ), I think we took approximately 50 photos because half of them were blurry and the other 48% had half of the knitted object in the frame. Even though I thoroughly expressed and even showed him by taking a photo of him from the angle I wanted, the Mister started to get agitated and cranky, claiming that I wasn't being clear and that he wasn't a mind reader. And even though he just ate, I swear the Mister was getting hangry. Cranky and hungry, not a good combo! Anyhoo, let's get to the FO, shall we? So back in October my friend Em had shown up at a knit night with a beautiful hat and fingerless mitts set that she calls the March Hare Hat and Mitts. As we oohed and aahed and completely manhandled her knits, several ladies in the group immediately offered their knitting services to test knit the patterns for her. Including me. So this is my test knit set. I knew in an instant what yarn and colours that I wanted to use. Back when Em was still running her yarn dyeing business I had bought a single skein of her Sublime DK in a gorgeous red called "Bite Me" (which I think is such a perfect name for it!). I had bought it with every intention of knitting a hat with it...it was just a matter of finding the right pattern. The skein had sat in my stash for over a year. I would have never guessed that the dyer would also be the one to design the perfect hat pattern for it. Because the red is such a showstopper it was only natural to want to pair it with a complimentary neutral. Enter: the skein of grey Madelinetosh Tosh DK that I had bought to make the Munchkin a new hat with. Well, it turns out that the Munchkin doesn't like the colour grey and didn't want a new hat (whose kid is this??). The Munchkin's loss is my gain. Yay for being able to use stash yarn and not having to buy more! But as I was knitting the hat I started to kick myself regularly for not buying a sweater's worth. With every row I had to stop and admire just how gorgeous this tonal red is and marvel at how much depth there was. Several times I tried to capture the beauty of this colourway with both my fancy DSLR camera and my phone but both devices either couldn't handle the intensity or downright didn't like this particular shade of red (I'm guessing they just don't like red at all). I used to claim that Madelinetosh's Tart was my most favourite red, but that was before I had knit with Bite Me. If Em ever decides to start dyeing yarn again, you can bet I'll be first in line to snag a sweater quantity in this! This set took less than a week to whip up, which is perfect for quick knit gift knitting. Each mitt took a day to knit up and the hat about two. I'm sure I could have knit the hat in less time but I was using a 16" circular and usually find the tips for that length really awkward to knit with due to the way I hold my needles. But even with the awkwardness I still find it much faster to knit with the smaller circular than to knit it Magic Loop style. Since this was a test knit I didn't do any mods. Although please note that there are suppose to be a pair of contrasting pom poms dangling from each mitt at the cuff. 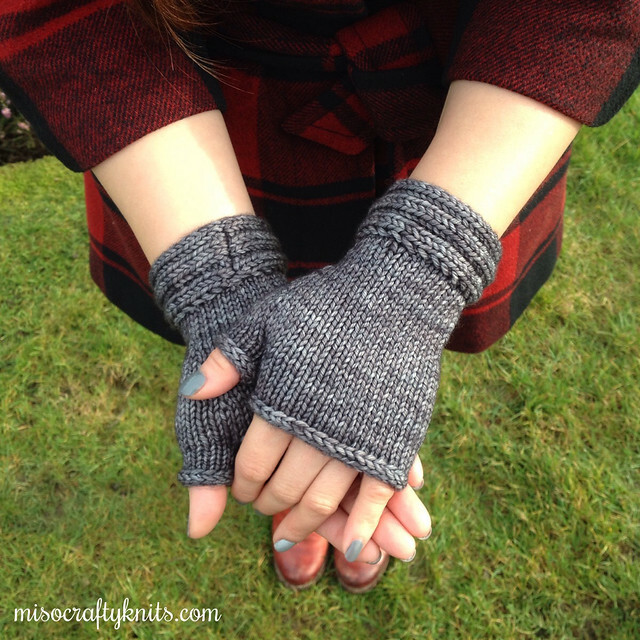 I had made them but was way too eager to wear the mitts before I could attach them. The pom poms are somewhere on my desk, yet I wouldn't be surprised if I found a few of them amongst the Munchkin's toys. I'd like to say that they will eventually find their way onto the mitts, but if truth be told, they probably won't. Not because I don't like the design idea, but more so because I tend to put my gloves/mitts on before my jacket and have a feeling the pom poms would just get caught in the sleeves. That, and I'm too lazy to try to track down all four pom poms again, twist them up into pairs, and attach them to each mitt. Besides, it already took me a few months to attach the pom pom on the hat and that's just one pom pom! I'll admit that after I had blocked the hat I started wearing it out and about. Never mind the fact that I didn't even bother to trim off the woven in ends (please tell me that I'm not the only one who sometimes doesn't cut off their ends before wearing!). Again I had made the giant contrasting pom pom needed for the hat and for months it was carried around in my main project bag. Finally a few weeks ago, after I had to move the pom pom for the millionth time to get to my notions case, I decided that enough was enough and that the pom pom needed to be attached to the hat. I'll also confess that I didn't do a pretty job of it. On the inside, that is. I had left long enough tails so that I could thread the ends into the hat and tie a bow on the underside. My friend Rebekkah had a brilliant idea of knitting her hat in a neutral colour and then plans on making pom poms in an assortment of colours so that she can switch them out interchangeably to match her outfit or mood. 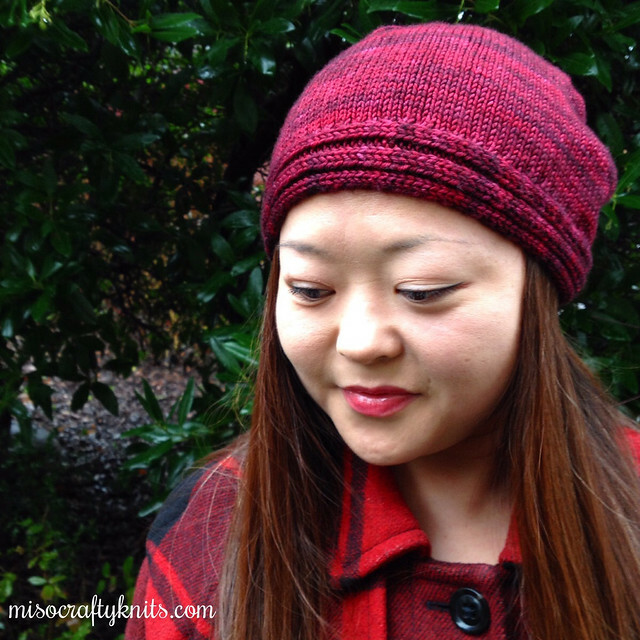 I love that idea and must keep that in mind for the next hat I knit that involves a pom pom. I absolutely love my set. 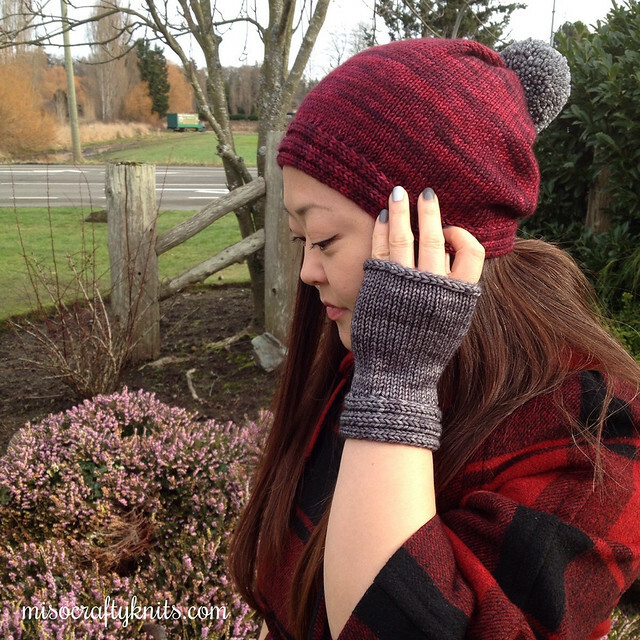 The hat has become the go-to hat that I wear on a daily basis and the mitts are perfect for quick errands and for when my hands are cold but I still want to knit. I find most fingerless mitts cover too much of my fingers for them to move freely but since these mitts are finished with a clean and beautiful i-cord bind off, they are short enough for optimal movement and doesn't snag the yarn or mess up my tension as I knit. The one thing that I should have thought about as I was knitting them and that I would change for next time, would be to knit the bands for the mitts at the same time so that they would come out the same length. I don't know why but I had knit them separately and thought I would be able to keep track of how many rows I had knit for each. Nope. I completely lost track on the second mitt and I think I was off by a row or two. Which doesn't sound like much but one mitt band is a little bigger and a smidge loose than the other. I don't think it's noticeable and doesn't really feel any different. But it still bugs me sometimes. But that's the perfectionist in me. Em released the patterns last November (I know, I'm horrible for only now blogging about them!!) and you can purchase the patterns as a set (which is the best deal) or separately. I highly recommend both patterns (and not just because Em is a friend either! ), as they were clear in their instructions and included photo tutorials: one for how to twist, achieve the same length, and attach the pom poms to the mitts; and how to knit the eye-catching pleated crown decreases (which you can see two photos up). 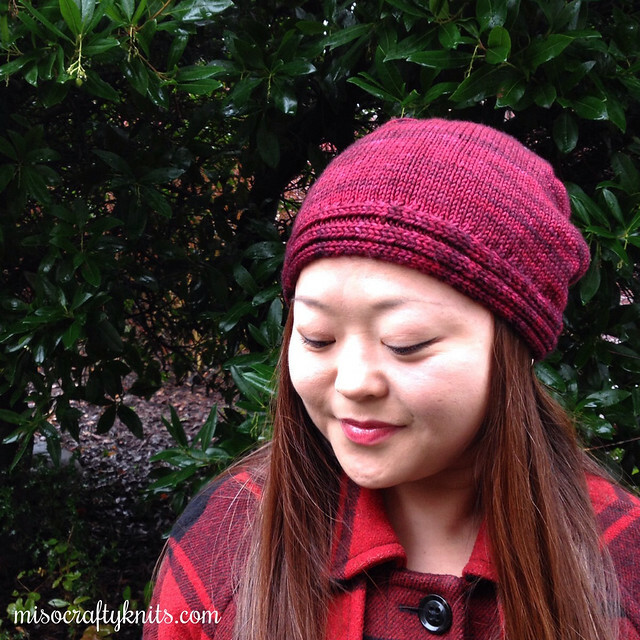 I would love to knit another hat in a grey and use Rebekkah's interchangeable pom pom idea. 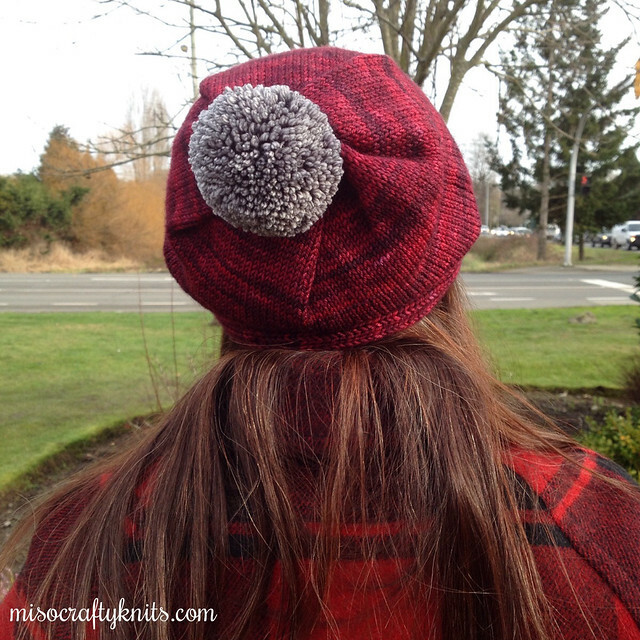 Because who doesn't love a hat with a big squishy pom pom on it?? But that might have to wait until either next fall/winter or until I can allow myself to buy more yarn. But let's not talk about that...yet. Again, my phone couldn't capture the red right in this photo! I loved your work so much that I immediately went and downloaded both patterns. Your knitting is beautiful, as is your selection of yarn/colours. Thank you! I really hope you enjoy knitting up both patterns as much as I did!! I love this set, and the pom pom especially!! Pom poms in general are so hard to resist!! Oohh...I'm always eyeing Sweet Fiber's Ina's Red!! At Knit City I was SO tempted to buy some but had to remind myself that I have a fair amount of MadTosh Tart that I should probably knit up first. I just might have to destash some to justify getting the Ina's Red!